A screenshot of the Survivor 2299 site as of Thursday morning. Fallout 4 speculation is still going strong after the Survivor 2299 website–which many believe is a viral site intended to promote the game–posted new code on Wednesday evening. UPDATE on Saturday: The Survivor site has been revealed as a hoax. 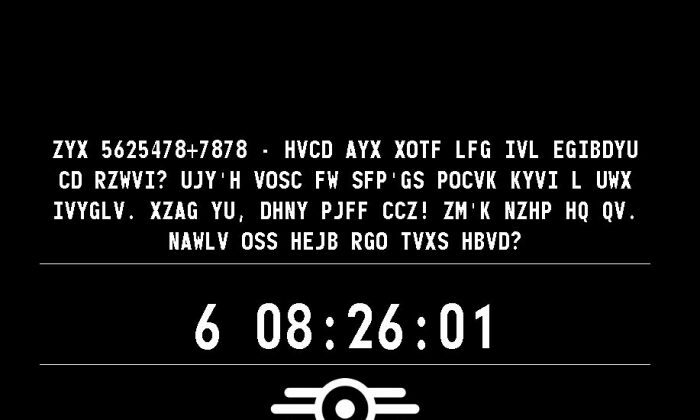 The site has been continually offering updates since last month, posting cryptic messages including items about “nuclear winter” as well as text and morse code that have been deciphered by fans at the Fallout sub-Reddit. A new cipher on the frontpage was added at around 8 p.m. Wednesday. “ZYX 5625478+7878 – HVCD AYX XOTF LFG IVL EGIBDYU CD RZWVI? UJY’H VOSC FW SFP’GS POCVK KYVI L UWX IVYGLV. XZAG YU, DHNY PJFF CCZ! ZM’K NZHP HQ QV. NAWLV OSS HEJB RGO TVXS HBVD?” it reads. An hour earlier, new morse code–the beeping sound–was placed in the background. The message above makes reference to The Institute, which is an entity mentioned in the Fallout 3 games, but not much context was given about it. It has been described as a mysterious group that is placed inside The Commonwealth known to have high technology, and is said to be the remnants of the Massachusetts Institute of Technology, or MIT. The Survivor 2299 website, which prominently features the Fallout Vault-Tec symbol, was apparently registered by Bethesda company parent ZeniMax. There’s been speculation that the whole thing is a hoax, as neither Bethesda or ZeniMax have commented on the matter. This week, a new sub-website was found and has a different format and different text. Redditors speculated that the “great game” bit was in reference to a line by Fallout 3 NPC Desmond Lockheart.